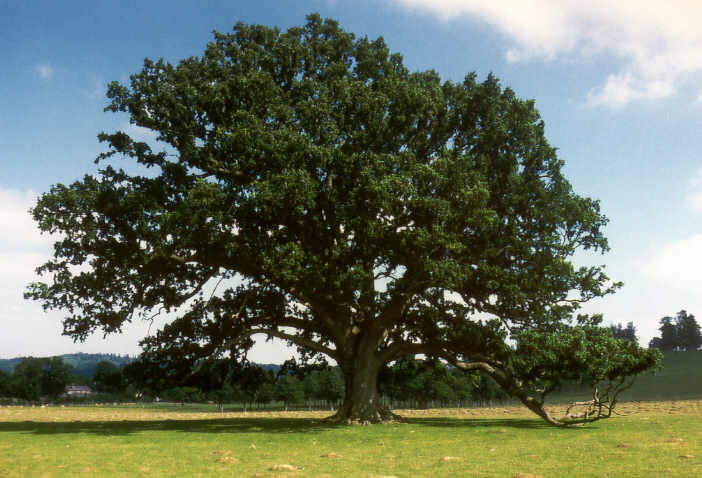 The Pedunculate Oak or English oak is native to most of Europe. The Pedunculate Oak is the type species of the genus, and a member of the white oak section. The populations in Italy, southeast Europe, and Asia Minor and the Caucasus are sometimes treated as separate species. A close relative is the Sessile Oak, which shares much of its range. The Pedunculate Oak is distinguished from this species by its leaves having only a very short stalk 3–8 mm long, and by its pendunculate acorns. 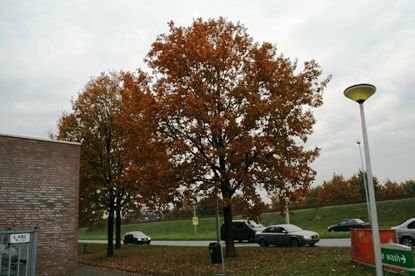 The Pedunculate Oak is a large deciduous tree 25–35 m tall (exceptionally to 50 m), with lobed and nearly sessile (very short-stalked) leaves 7–14 cm long. Flowering takes place in mid spring, and their fruit, called acorns, ripen by the following autumn. The acorns are 2–2.5 cm long, pedunculate (having a peduncle or acorn-stalk, 3–7 cm long) with one to four acorns on each peduncle. It is a long-lived tree, with a large widespreading crown of rugged branches. While it may naturally live to an age of a few centuries, many of the oldest trees are pollarded or coppiced, both pruning techniques that extend the tree's potential lifespan, if not its health. Within its native range the Pedunculate Oak is valued for its importance to insects and other wildlife. Numerous insects live on the leaves, buds, and in the acorns. The acorns form a valuable food resource for several small mammals and some birds.